50 GRIT plays roots rock. A 50 GRIT song sounds like the original version of a song you've heard someone else cover. The ingredients come from all over the map - anything from vintage Britpop to classic American twang, taking steps toward sweet soul, but keeping a foot in the garage. The lyrics fit the music, capturing complex emotions within simple expressions, wry one-liners or impassioned shouts. Guitar, bass, drums and voice all stake out their territory but leave space for the hook to come through. People can often sing a 50 GRIT chorus after hearing the song once - but the songcraft and musicianship reward repeat listening. The band is fronted by singer/guitarist Theron Paul Stevenson, who learned how to catch people's ears while playing solo acoustic shows in noisy taverns all over Seattle. He balances a trenchant vocal delivery and dynamic guitar playing with an engaging, amiable stage presence. Bassist Christopher "Hey Hey" Scott has played with Theron for five years - always solid - always in tune with the feel of the song. Chris earned his nickname after mastering the art of the non-verbal rock 'n roll background vocal. 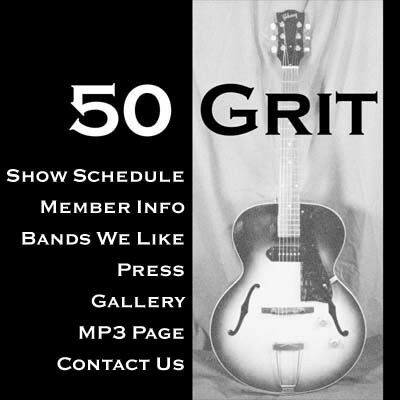 From the heart of Ballard, 50 GRIT brings roots rock to the world!